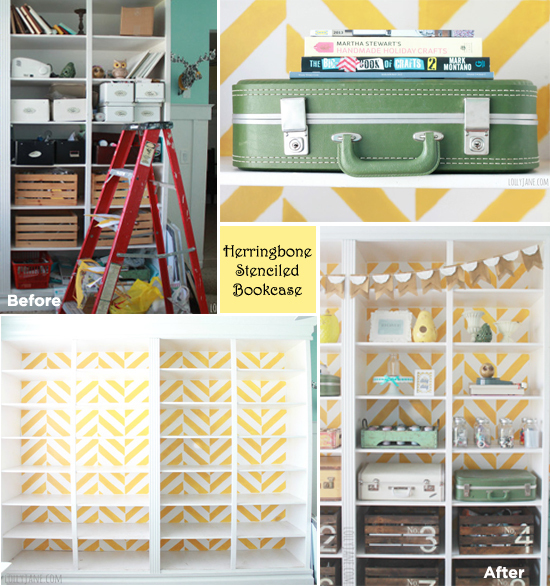 Herringbone Stencil Ideas and A Chance to Win a FREE Stencil! Happy Hump Day, my crafty DIY’ers! Your middle of the week hump is about to get a whole lot better. Are you ready for this? Last week we unveiled 15 dreamy new stencil designs that we’re still oohing and ahhing over. 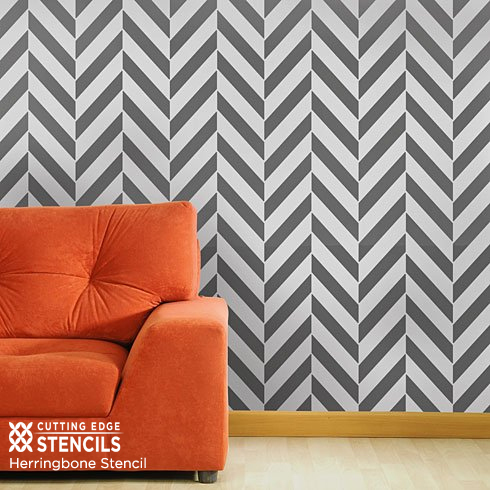 This week Cutting Edge Stencils‘ a barrel full of fun stencil projects featuring our new Herringbone stencil design and a giveaway to top it off! On her blog, Kelli walks her readers through her Craft Room transformation and even features some before, during, and after photos to show the drastic change. And wow, what a difference the stencil makes on the back of the bookcase! The yellow stencil really gives it a fun pop of color. The decorating idea took about a day for her to complete. She admits “I started midday and ended around midnight, taking breaks for real life.” While Kelli is no stranger to Cutting Edge Stencils (she has a number of stencil projects under her belt from her dining room, to her curtains and even the bathroom), she assures that any rookie can complete a stencil project like this. Hey, why not give it a try! The results are not only absolutely gorgeous, but you’ll feel like a rockstar when it’s done! Lolly Jane is also hosting a week long giveaway (2/19/13- 2/25/13) for a chance to win a free stencil of your choice up to $50 from Cutting Edge Stencils! Visit the giveaway post here to enter! Still looking for some Herringbone eye candy? Be prepared to drool over this navy and white Herringbone design stenciled in this contemporary living space. Use colors similar to Benjamin Moore’s hale navy and cloud white to get this look. Add a sofa in a contrasting color like the orange-nectar shown and your space becomes truly captivating! Can you take your eyes off of it? I bet not! 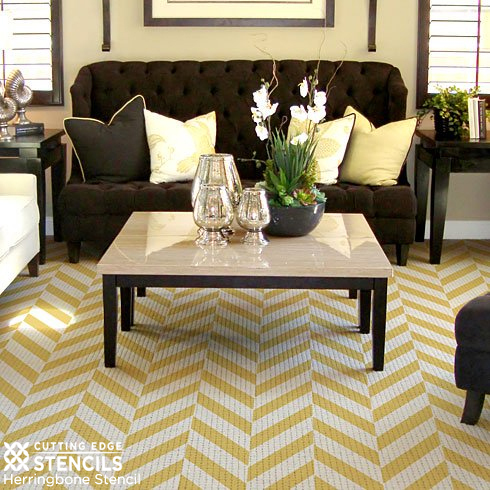 Use the Herringbone Stencil on your Sisel rug and your guests might just spend their visit staring at their feet! But don’t stress, your conversation isn’t boring them (at least we hope not), your stenciled Sisel rug is just to charming for them to take their eyes off! Transform your plain Sisel rug using colors similar to Benjamin Moore’s hawthorne yellow to get this look. Now that you’ve seen the Herringbone stencil on a bookcase, an accent wall, and a Sisel rug. Where do you prefer this contemporary stencil design? Check out our 15 amazing new stencils! Follow us on Pinterest and Facebook for awesome inspirational photos! And don’t forget to visit the giveaway post on Lolly Jane to enter! Thanks for reading, and good luck in the giveaways!